>indiana jones and the kingdom of the crystal skull. > …this movie was awful. i wasn’t expecting much, but it came no where near even my lowest of expectations. it started out alright with the potential for a decent indiana 4, but goodness gracious did they fall short. before i get too far into my negativity i need to address something: harrison ford still rules and he did a great job with the script/plot/screenplay that was presented to him. unfortunately, all three of those things sucked. the plot was the worst. it moved about 9 million miles per hour from point to point. 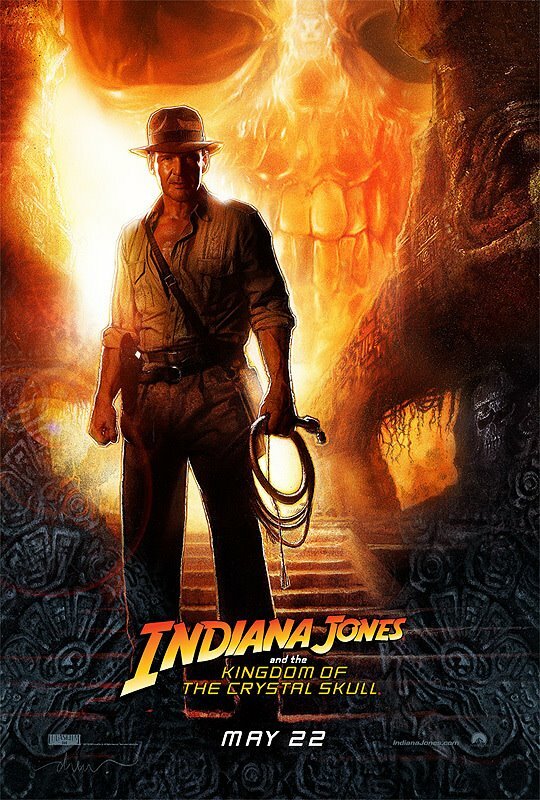 in past indy films they’d spend 30 minutes acquiring a certain artifact, but in this one they manage to make it to about 6 different locations within about 10 minutes of footage. it was really tough to keep up with what was even going on or why people were even fighting or why they were even interested in the plot at all. and when you can’t figure out why the characters would be interested in the plot then its super difficult to want to stay involved in the movie yourself. i’m not necessarily sure what george lucas was thinking when he agreed to do a 4th movie. cause not only was this one terrible, but it has slightly tainted the other three for me. i love the original indiana jones series, and i’ve already decided that i refuse to affiliate this one with the other three. it was unrealistically awful and at times i forgot i was even watching indiana jones. it was just weird. shai labeouf was an interesting addition. not sure if i liked him or disliked him. i think his character was a good idea, but he’s the same kid that played in Even Stevens and Transformers in my mind. i can never get past that. and Holes too. loved Holes. another thing that annoyed me: it was very obvious that this movie had a HUGE budget, and i feel like they added in special effects just cause tehy could afford to. which is dumb because indiana jones does not thrive on special effects, it thrives on intense heroics and great one-liners. both of those can be accomplished with or without crazy usage of special effects and/or computers. it just seemed a bit out of place when thinking about the other movies. don’t waste your money. i went during the $5 cheapo time and it still wasn’t worth it. the $6.50 popcorn was a much better deal than wasting 2 hours of my life watching that business. do yourself a favor and don’t even rent it if you have ANY respect for the first three. it’ll just bum you out and make you question george lucas. which isn’t healthy in my mind. its just sad that they waited 20 years to make it and it came out so disappointing. i just wish it hadn’t been aliens. just anything but that. i give it a 1.5 out of 5. sigh. at least they didnt spell crystal with a k.
>dude, i felt so differently about it. i totally loved it. it was definitely the weakest story of the four, but you don’t go to the indy movies for the story. i felt like it was exactly what i expect from an indiana jones movie. the tarzan stuff was way over the top, but aside from that, i didn’t notice any real discrepancies from the original trilogy.as for special effects, it was no more than what they did for the ark scene in the first one. just with much better technology. they didn’t want to overdo special effects and make it look different than the originals (like star wars) so they still used a stunt man for everything and all that…i smiled all the way through it, and definitely enjoyed it. >dude, awful awful awful. this guy i met here in korea was saying that the first three were alright and this one was the best. i almost slapped him. >i’m sorry you hated it so much.if i could get your money back for you, i would… but i can’t. i’m sorry.just make sure you don’t go see the future movies with shia lebouf, mutt jones…that i can save you from. Previous Previous post: >mentos and diet coke.